We were late by almost 30-45 minutes... when we reached the auditorium at NGMA Bengaluru, Gieve Patel was lecturing on his paintings of clouds... he was explaining the property of them being formless...without any shape. The auditorium was 40 percent full and the audience was completely absorbed in the mellifluous tone. 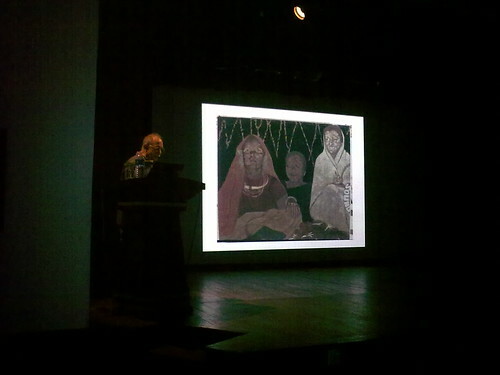 Patel moved back and forth from one topic to another, some from his plays, some poems and then on his paintings. He explained many incidents from his plays, their significance and meaning, the philosophy behind and a lot more. He explained them with a great simplicity, good voice modulation, dramatizing the conversations in the most appropriate manner and making it very easy for the audience to understand. It was very special. Very relishing. He also gave examples of valuable lessons on guilt, self-realization and redemption from Leo Tolstoy's life and his novel- Ressurection. One of his thoughts on his method of painting and the philosophy behind it is - When a painter paints a character he uses his brush to paint him... this process is very subtle and he actually touches that person through the brush strokes and in this process he knows him... the essence of the character. Gieve Patel has painted various characters from day to day life and which the projector flashed on the big screen infront of us and these characters he had developed a very special bond with... he loved drawing them, bringing out the hidden beauty inside them with his own style, imagination and observation. Surely there was something unique, special and refreshing about his paintings. They gave sheer bliss to the viewer. Somewhere around 2 hours passed in a flash, and the question and answer session followed. By this time I had to come out of the auditorium because my 14 months old son was getting restless and cranky. But I did manage to catch up a few lines of conversation with this great artist. As I stood infront of him, listening intently to an answer he was giving to another person... his words as i could remember... " I stop at a painting when I realize that if I continue further, it will spoil the painting." I quickly added, "It is the same way when we conclude our eating since we realize we are completely satiated." He gave a wide grin and patted my back, adding " That's right!" I asked him - 'Well Sir, I myself am trying to be a painter and trying to paint in the most genuine way and which I truly believe is good...but how do I know that I am painting really good or what if the world doesn't appreciate?" His reply was very short - "You have to keep looking at paintings by great artists." With those final words he got inside his car and disappeared into the busy Bangalore Traffic, through the main gate of NGMA.